I have interest in it, pls give more details to join the camp.. Details have been mailed to your account, kindly check. 11 feet King was found in East godawari district of Andhrapradesh,if u need more details pls check 4th sep 2013 Eenadu telugu paper. I appreciate this information Srinivas. I have received the news clipping. I am in touch with people there. We plan to change this in future soon. Thank you. 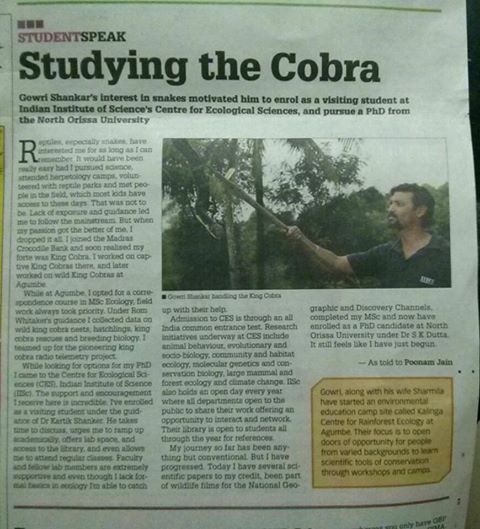 I would like to do my final year project to know about king cobra behaviours and all…plz give me some information what should i do for my project. I’m so much intrested in snakes. But I don’t know how to get into that field and take up a career. But I have no biology background. Im a M.A graduate . Please help me out. You could start reading about it and then volunteer with organisations that work on them. That should give you a good start. All the best. Big fan of yours sir!!! Rahul here from Bangalore.